Walter Masterman Carter was born in Robin Hood's Bay, North Yorkshire in 1892. He joined the merchant navy around 1911, and by the following year was serving as a 3rd mate. By the time the 1st world war broke out he was serving as a 2nd mate. He lived in Brook Cottage, Thorpe. 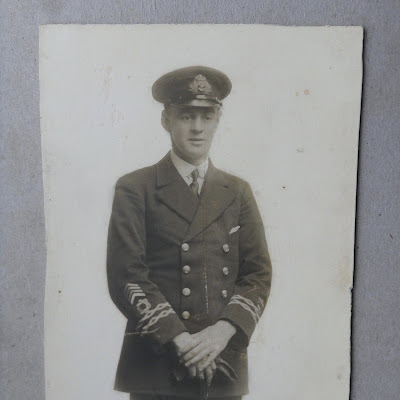 By 1915 he was serving as a temporary Sub Lt. in the Royal Naval Reserve. On the 9th August 1916, he was appointed to commence duty as the Navigating Officer on board HMS Moth. WW1Battle1408Mesopotamia.htm. Suffice to say that whilst his ship and some others were proceeding up the river that they were fired on by the Turkish army. During this action the ship, a small gunboat, was hit 9 times and was badly damaged. 3 crew were killed. Following this action he lost all his possessions and only had the binoculars he carried around his neck. I have these. His binoculars from HMS Moth. According to my grandmother these were his only possessions from the ship. The rest were destroyed in the action. I have a letter from the Admiralty dated 8th May 1918 expressing their appreciation , "be conveyed to Lt. Walter M Carter of HMS Mistletoe, who was in charge of Lighter 171 for the good seamanship he displayed in bring his vessel safely into Peterhead". I have his Continuous Certificate of Discharge (Discharge Book), from the merchant navy, several original admiralty documents and his Master Mariner Certificate, issued 12th May 1919 after he left the RNR where he returned to the merchant navy. He died in 1929 on board his ship at Hartlepool after swallowing laudanum to help him sleep. His wife, my grandmother, Winifred (nee, Wedgwood) was with him at the time. Read the .press cutting published following his death. He and one of his brothers, Ernest Carter are buried at St Stephen's Church Robin Hood's Bay, Yorkshire. He had three children. My mother Jeanne Carter, (Later Perry) and Freda Carter b 19.03.1922 & William (Bill) George Carter b 17 April 1919..